RAGING SLAB - RAGING SLAB VINYL (LP) | Online Shop | Wizard LTD. 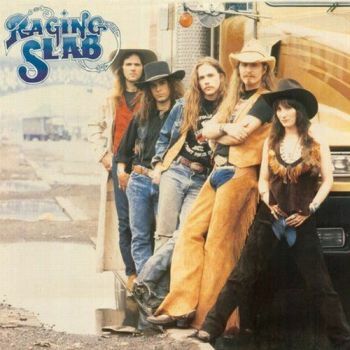 Album: "RAGING SLAB VINYL (LP)"
Raging Slab's first major-label album is pretty interesting in retrospect, in that it's both of its time and very clearly a harbinger of the future -- which of course is all the more bemusing in that the band was so clearly inspired by the past more than anything else. The quintet's obsession with '70s rock trudge and stomp -- perfectly evident with song titles like "Shiny Mama," "Get off My Jollies," and "San Loco" -- pretty soon would get full validation in the grunge explosion and even the n-metal fallout later. The clipped blasts of feedback on the verses of lead single "Don't Dog Me" aren't that far removed from what Ross Robinson would oversee in later years, while some of the massed harmonies at points -- "Geronimo" is a great example -- easily foreshadow Alice in Chains' take on it. But Daniel Rey's production here is different from the arid punch of the end of the millennium, and his ghost-of-Rick Rubin take on things feels both sprawling and a bit straitjacketed, like it just wanted to go completely nuts but still felt like the way to go was classic rock radio instead of alternative stations. All this aside, though, it's a fun album nonetheless, no particular revelation but a loud enough grind and shake that's actually a bit easygoing in ways -- songs like "Joy Ride" and "Bent for Silver" wouldn't sound out of place over the PA while waiting for a Foghat show. Elyse Steinman's work on bottleneck guitar combined with the rest of the feedback is a nice touch -- it's not quite Lynyrd Skynyrd's triple-guitar attack, but it's not entirely meant to be, and songs like "Geronimo" easily benefit from it. Meanwhile, Greg Strzempka's singing has the swagger down if not quite a unique, memorable approach, though it works surprisingly well on the quieter, downright tender songs like "Love Comes Loose" very well indeed. Gregory Strzempka (vocals, guitar); Mark Middleton (guitar, background vocals); Elyse Steinman (slide guitar); Alec Morton (bass); Bob Pantella (drums).Additional personnel: Paul Prestopino (dobro); Steve Wacholz (percussion); Ray Gillen (background vocals). Recorded at the Record Plant, New York, New York between January 18 and March 5, 1989. Includes reissue liner notes by Gregory Strzempka.